Mr. Hall’s publishing house, Thames River Press, gave me a copy of this novel in exchange for my review. I have not read any of the books in the Dan Groves series prior to the release of Shadows of Justice. In light of the George Zimmerman case in Florida and public opinion regarding the outcome, Shadows of Justice is a timely novel. When justice fails, what comes next? The work posing this question gives a chilling rendition of the fallout. Simon Hall is a television crime reporter in his daily life but has a keen sense of the dramatic in his writing. Few reporters, with the exception of Dateline’s Keith Morrison, have the luxury of painting a picture and drawing a moment with each event perfectly timed. In one scene, Dan, Adam and Claire have an audience with another character only for him to smoothly walk back and forth in front of them before producing a weapon. The method in which the character produces the weapon is fluid and concisely drawn, the detail of the moment highlighting the smallest movement. This reader was biting her nails and wondering if Hall was the sort of writer who would kill a character and which way he would go! I had to read on to know immediately. As hard as the story was to get into, it was impossible to stop reading. This flair for the dramatic backfires a bit on the author when he describes settings. Hall could have relied on the characters to set the mood but was also clearly very concerned about setting a mood with backdrops. In so doing, the backdrops were overpowered by the characters and read as generic. Early on in the novel, Hall tells us through narrative, “An old cliché took on new meaning in the life of a television reporter” (Page 15). Hall seems to maintain that cliché in his writing. “I’m fed up with the Sherlock Holmes act”, a character says to Dan and in reading, I was reminded of the old Star Trek joke, “Dammit, Jim, I’m a doctor, not a (fill your favorite response in here)”. Hall is clearly a fan of the cop shows of the 1980s in that his characters read with a hint of that inspiration. You have the rogue who has to prove himself in each episode. Dan fills that rogue role perfectly. 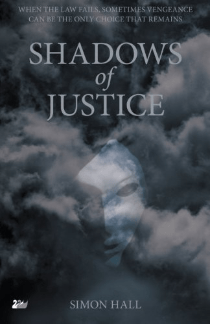 If you like British crime noir and old-school writing styles, you will love Shadows of Justice by Simon Hall. The novel has earned 10 five-star reviews on Amazon.co.uk. This reader is not at a five-star rating but would be willing to go for four stars. There’s nothing wrong with cliché if it’s done well, but as a reader, I feel that the story was probably a bit overly worked. Though it must be said, the wrapping of the storyline and ending are done very well and really lead all of those straying plot lines together. Simon Hall is a BBC crime correspondent. For more information about Simon Hall and his work visit his website and Fantastic Fiction. You can connect with Simon Hall on Goodreads and Twitter @SimonHallNews. Series Readers can track his books on FictFact.